Here, I generally tend to avoid mention of all things political mostly because that particularly bias-ridden topic of frictional dimensions is best saved for the Express Checkout site next-door. But political art, of course, is not unheard of; and I can’t seem to get a particular series of pieces out of mind whilst being bombarded by sound bites and blips steeped in the current US Presidential Election bickering. To say the least, it’s quite unfortunate that several pundits and soon-to-be voters are so easily caught up in the minutiae of campaign coverage. And whilst forgetting about the pressing issues bound to re-emerge in a few months when the populace is once more reminded of the reason democracy exists, the focus has been turning to candidates’ hair, lipstick, farm animals, and strings of words taken out of context in order to spice up headlines and win over any gullible individual with thirty seconds to spare. What Andy Warhol himself observed on the American political scene back in the Sixties is aptly demonstrated in his Flash Suite Portfolio. 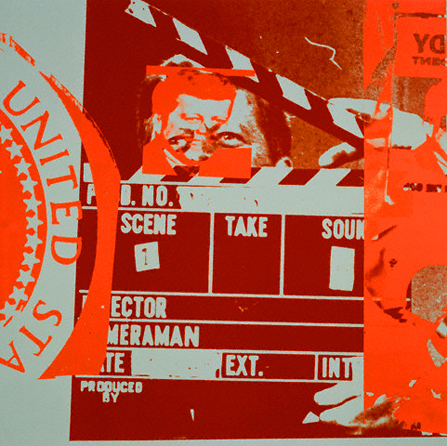 In fourteen color screenprints made from images seen in newspapers and on television from the tragic assassination of President John F. Kennedy on 22nd November up until his funeral in 1963, Warhol recounts not only the actual events that took place but also relays the inescapable barrage of broadcast and print media coverage. In Flash, through pieces like the one featured above, his display of the continuous omnipresence of the power of the media sheds light upon a phenomenon that has only become more deeply entrenched in political culture since then: emotion and perception are too easily overcome by the repetition of sound, text and imagery in the news. And that leaves open the question of what that does as a result — enlighten? or embellish? The stark narrative accompanying Warhol’s portfolio seeks to shed light on such questions; he may not have been at all surprised to see the current state of affairs had he been alive today.